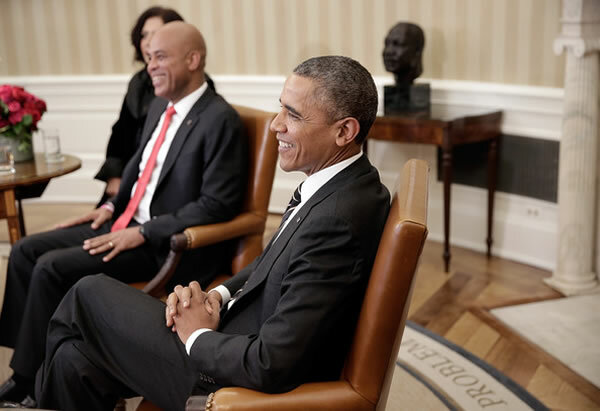 Here is a picture of President Michel Martelly and Barack Obama in Washington DC. For the first time, the U.S President Barack Obama met the Haitian President Michel Martelly on February 6, 2014 at the Oval office, Washington DC. The visit served as an opportunity for both the Presidents to discuss how the United States can continue its support to the Haitian government's effort to promote economic growth and strengthen democracy. The U.S President had said that he is satisfied with the recovery efforts of Haiti from the devastating earthquake and Martelly's sincere effort in holding the overdue election, but added that the progress had been very slow, may be of the complicated processes involved. He confirmed U.S.'s support on matters relating to improving the conditions of human rights, judicial reform and controlling corruption in the country. President Martelly thanked him for standing by the side of Haitian people. As per Ros-Lehtinen, a Congresswomwn and Representative from South Florida, Martelly took careful notes of every matter discussed and addressed every relevant question.